To reach our technical services specialist, call 301-277-8681, or email info@gypsum.org. Issues and concerns that seem unique to a specific project often need the advice of someone specializing in gypsum board technology. Answers to Frequently Asked Questions (FAQs) address some common concerns. FAQs are updated periodically, especially as questions recur. Feel free to contact the Association staff by phone or email, or by using the form, below; we welcome the opportunity to assist you. The Gypsum Association has published a position document on Gypsum Area Separation Firewalls intended to clarify clarify the criteria for the placement of utilities in the flanking walls on either side of a two-hour steel H-stud gypsum shaftliner panel area separation wall. How do I prevent mold growth on gypsum panels? Gypsum board must be kept dry at all times to prevent the growth of mold. Review publication GA-238-2016 Guidelines For Prevention of Mold Growth on Gypsum Board. This quick reference publication will note transportation, storage, handling, application, and maintenance guidelines. How do I know whether or not to replace gypsum board after it has been submerged in a flood? You will want to reference GA-231-15 Assessing Water Damage To Gypsum Board. Most notably, gypsum board that has been exposed to sewage or flood waters must be replaced. The levels of bacteria, such as E. coli, can be hundreds of times above safe levels in flood water. Also, hydrocarbons from underground gas storage tanks and fuel leaks from submerged vehicles can be present. Often, the board will need to be removed anyway to assess the underlying substructure. Is there a way to ensure that the gypsum board selected for my home restoration is code compliant? The name of the manufacturing company or a unique alpha code identifying the name of the manufacturing company. The decision to print the name of the company or to create and use a unique code is at the discretion of the company. A code identifying the manufacturing facility and, where applicable in a multi‐line facility, the production line. A code identifying the date and time of manufacture. The country of manufacture as designated by the three letter code in ISO 3166‐1. The code for United States is USA. The code for Canada is CAN. What is the proper way to store gypsum board on a project site to prevent moisture damage? Pages 8 and 9 of GA-801-2017 Handling And Storage of Gypsum Panel Products: A Guide for Distributors, Retailers, And Contractors describes guidelines for stocking gypsum panel products on job sites. These two pages note that gypsum panel products shall be delivered just prior to installation time. This practice helps minimize damage to the material and reduces the risk of mold growth in surrounding areas of elevated moisture. GA-801 also notes panels must be kept in an enclosed covered, dry area, such as a garage, to minimize exposure to rain, etc. After a fire event, does the drywall need to be replaced in rooms where fire occurred? What about rooms without fire exposure? This is a very complex question. First, let’s look at just the fire/heat exposure aspect of a fire. For fire rated assemblies, The GA-600, Fire Resistance and Sound Control Design Manual states, “It is the intent that classifications shall register performance during the period of exposure and shall not be construed as having determined suitability for use after fire exposure.” Therefore, any assembly directly exposed to the fire should be rebuilt. For rated-assemblies not exposed directly to the fire (say in another room), it is always best to have a certified/licensed fire protection engineer or inspector inspect them and determine if they are still capable of performing as designed, should another fire occur. For non-fire rated assemblies exposed directly to the fire, replacement is also suggested as the exposed gypsum wall board would have experienced adequate heat to begin calcination. The board may be brittle, the paper face burned off, etc. Again, for gypsum wall board in non-exposed rooms, a judgement call needs made, and a specialist consulted who should be able to determine the extent, if any, of replacement required. However, fires also bring with them two additional elements, smoke and water. Water is the easiest to assess. First, it is critical to determine if the studs and other materials in the wall cavity are dry and undamaged. To do this, it is likely that the at least some of the gypsum wall board will be removed to inspect the cavity and its contents, thus, requiring some replacement. If it can be verified that the contents of the wall cavity are dry and undamaged without removal of existing gypsum wall board, a thorough examination of the wall board is required; it must be dry and free of mold with the paper facing completely intact. If any of these are in doubt, it is best to play it safe and replace the board. Smoke is more difficult to assess as it is very subjective. Some individuals claim to smell the smoke in sealed and repainted rooms years after a fire. Some people never catch a hint of the smell. Restoration services exist that are licensed and bonded, and these should be consulted with/by the property owner/resident as to whether a restoration without replacement is possible. Is it necessary to tape the joints in the base layers of fire-resistance rated multi-layer gypsum board systems to maintain the fire resistance rating? No. In multi-layer systems, the joints and fasteners in the base layers are covered and protected by the overlying layers of gypsum board. The system I am installing calls for "cooler" nails. I am having trouble locating a supply of these nails in my area. What kind of nail can I substitute for the cooler nail? Any nail having a length, shank diameter, and head diameter equal to or greater than the dimensions specified for the cooler nail in the system description can be substituted for the cooler nail. In a tested/listed fire assembly, what is the tolerance on the spacing of the fasteners described in the system? Working with UL, the GA and its members have determined that approximately ± 1” (± 25.4 mm) is an acceptable tolerance in the spacing defined in a fire-rated assembly. Must gypsum wallboard be finished and painted? All gypsum wallboard used in interior wall and ceiling applications should be finished with tape and joint compound embedded in joints and interior angles, as well as an appropriate primer and paint. The application of these materials protects the integrity of gypsum wallboard. Note, in a fire-rated system that includes multiple layers of wallboard, only the final, visible, wallboard surface needs to be finished with tape, joint compound, primer and paint. Exceptions can be made in areas that are concealed and received little or no active use, examples include attics and plenum areas above ceilings and attics. In these areas, tape and joint compound are required to provide fire resistance. To determine the level of finish appropriate to a specific situation, including gypsum panel products used as a substrate for tile, as a base for textured finishes, wallcoverings, and paints of various sheens, and lighter and darker tones, consult GA-214-2015, Recommended Levels of Finish for Gypsum Board, Glass Mat and Fiber Reinforced Board, available in the GA Bookstore. What considerations should we bear in mind when designing and building fire-resistive gypsum board enclosures for duct assemblies? Fire-resistive duct enclosures provide for some unique and challenging design and construction scenarios. First, the code specifies in most cases that fire-resistive enclosures around duct assemblies be symmetrical (i.e. the inside of any one plane must be identical to the exterior). The intent is that regardless of whether the fire is on the inside or outside of the enclosure, it has the same degree of restriction. Of course if a system is asymmetric but tested and certified both ways and passes the required fire-resistance criteria, it is acceptable. Second, you have to remember when designing the enclosure that systems designed/tested for vertical surfaces cannot be arbitrarily used on the horizontal (i.e. underneath side) of the enclosure. In this regard, this is the same as for full wall systems, which also cannot be arbitrarily used in floor-ceiling applications. Third, the system has to be built as tested. This means for a duct specific system the supports must be tied in, etc. per the drawings for the system. This also means for system designs adapted from tested wall or floor-ceiling assemblies, one must make sure everything is supported/built as in the drawings for the full system. This means the right sized structural members, spacings, fasteners, etc. In the end, consulting with a fire design engineer is usually a very good idea when dealing with these systems. What is a thermal barrier? What gypsum panel product(s) can be used as thermal barriers? A thermal barrier is a material that provides some protection from heat for substances that can melt or burn. National Fire Protection Association (NFPA) standard NFPA 275 provides a method for qualifying the fire performance of a thermal barrier. The Temperature Transmission Fire Test and the Integrity Fire Test are used to evaluate a material’s capacity to prevent ignition from a standard fire exposure or to delay its occurrence. The code reference often reads as follows, “[Material in question] shall be separated from the interior of a building by an approved thermal barrier consisting of 1/2 -inch (12.7 mm) gypsum wallboard or a material that is tested in accordance with and meets the acceptance criteria of both the Temperature Transmission Fire Test and the Integrity Fire Test of NFPA 275.” As indicated in the text above, a ½” gypsum wallboard is a thermal barrier as would be wallboards of greater thickness when applied as part of a fire resistant system. Want to learn more? Read Thermal Barriers and Ignition Barriers for the Spray Polyurethane Foam Industry. What are the acceptable joint tolerances in gypsum construction? Joints between boards in fire-rated assemblies must be in “moderate contact,” meaning that the boards should be touching and gaps minimal. All gaps and joints in such assemblies must be properly taped and filled with compund). Around electrical boxes, the UL Fire Resistance Directory references no more than a 1/8” (3.2 mm) gap/joint, though in the field this can be difficult to attain and measure. All gaps must be filled with joint compound, a fire-rated caulking or other materials/means suitable, per the local code authority. In non-rated construction, joints up to ¼” (6.4 mm) are acceptable when filled with setting type all-purpose joint compound. Note that the type of compound used to prefill gaps in the joints must be compatible with the compounds used to tape and finished the walls and/or ceiling. More information on joint tolerance is contained in the Northwest Wall and Ceiling Bureau Document #500-103Gaps at Gypsum Board Joints available here. The standard practice is to mount gypsum panel products such that a ¼” gap at exists between the board and the floor. Does this mean a fire-rated wall assembly needs to be caulked between the board and the floor? 708.8 Joints. Joints made in or between fire partitions shall comply with Section 715. 715.1 General. 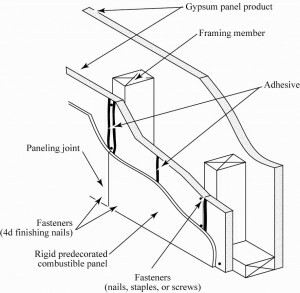 Joints installed in or between fire-resistance rated walls, floor or floor/ceiling assemblies and roofs or roof/ceiling assemblies shall be protected by an approved fire-resistant joint system designed to resist the passage of fire for a time period not less than the required fire-resistance rating of the wall, floor or roof in or between which the system is installed. Fire-resistant joint systems shall be tested in accordance with Section 715.3. Floors within a single dwelling unit. Floors where the joint is protected by a shaft enclosure in accordance with Section 713. Floors within atriums where the space adjacent to the atrium is included in the volume of the atrium for smoke control purposes. Floors and ramps within open and enclosed parking garages or structures constructed in accordance with Sections 406.5 and 406.6, respectively. Walls that are permitted to have unprotected openings. Roofs where openings are permitted. Control joints not exceeding a maximum width of 0.625 inch (15.9 mm) and tested in accordance with ASTM E 119 or UL 263. 715.1.1 Curtain wall assembly. The void created at the intersection of a floor/ceiling assembly and an exterior curtain wall assembly shall be protected in accordance with Section 715.4. Additional information on the topic of firestopping can be obtained from a firestopping manufacturer or The International Firestop Council www.firestop.org/. What is an R-value and how can I calculate the R-value of a wall assembly shown in GA-600 Fire Resistance Design and Sound Control Manual? Finally, why am I being asked to do this? R-value (resistance value) measures the capability of a material or assembly to resist the transmission of heat. As energy codes have strengthened over the past several code cycles, so have the R-value requirements for exterior walls and roof assemblies, in particular. As codes have become less prescriptive and more performance based, calculating R-values is becoming a part of every design teams’ duty. The GA does not list R-values for wall assemblies due to the high degree of variability between what is shown in GA-600 and what is actually constructed. Common elements, such as resilient channels, thicker studs, decreased stud or joist spacing, varying amounts and types of insulation, etc., are variables that are allowed for any system, per the General Explanatory Notes in GA-600. Variables such as cladding type also play a role in total R-value. However, calculating the R-value for an assembly is not exceptionally difficult, as it is essentially the sum of the R-value of the individual layers, accounting for stud closeness. ASHRAE, ICC, DOE and others have developed practices and methods for calculating R-value that are code acceptable. One online tool based on ASHRAE’s Handbook of Fundamentals information and practice is available at www.ekotrope.com/r-value-calculator/. A quick online search will provide additional online tools for performing these calculations. I understand that even Mold/Moisture Resistant Gypsum Panels should not be used in so-called “wet areas.” Can you explain where this product can and cannot be used? Mold/Moisture Resistant Gypsum Panels are excellent for use in high humidity areas and even where an occasional splash of water is expected. Appropriate areas include powder rooms, adjacent to showers or tubs, behind counter areas/base cabinetry where plumbing fixtures are located, and in laundry rooms, mud rooms, etc.. However, neither the model codes nor the Tile Council of North America’s (TCNA) Handbook allow for the use of these boards behind the tile in the shower or tub area or as a base under the pan or around a swimming pool or sauna. For acceptable materials in wet areas, consult the local code or the TCNA. What guidance can the Gypsum Association provide on the painting and finishing of new gypsum wallboard? Over the years, the Gypsum Association has worked with many organizations to develop recommendations on finishing. The most important recommendation is priming: Before any additional decoration, wallboard must be primed. For a more complete guide on painting and finishing new wallboard, we suggest the Drywall Finishing Council publication entitled, “Recommended Levels of Paint Finish Over Gypsum Board.” Access this publication here. Additionally, GA-214 Recommended Levels of Gypsum Board Finish, provides guidance for surface preparation. GA-214 is available in hardcopy or PDF in the Gypsum Association Bookstore. Is there guidance from the Gypsum Association on when drywall needs to be replaced after a fire? The short answer is no. Any wallboard that has been damaged by fire or as a result of the firefighting process must be replaced; however, board that was simply exposed to smoke has no definitive replacement criteria. In this case, replacement will be determined on a case-by-case basis by the owner, contractor and insurance company. I have a renovation project where I am required to install a 1-hour fire-resistant floor/ceiling assembly that is also sound rated. I have found an assembly in the Fire Resistance and Sound Control Design Manual that is comparable, but uses I-joists of the same dimension of the sawn lumber joists I have on this project. Can I use that assembly anyway? As a sawn lumber joist is of greater dimension and mass than the same sized I-joist (you can see this by looking at the cross-section), so long as the structural criteria are met, you may make the substitution. 2.2.12.4 Where studs complying with ASTM C645 are used to receive Abuse Resistant or Impact Resistant Gypsum panels, they shall be not less than 0.0312 in. (0.792 mm) design thickness and shall be in accordance with sections 4.3 and 8.1 of Specification C645. The correction clarifies the recommended thickness for steel studs receiving abuse resistant or impact resistant gypsum panels contained in GA-216-2016. The GA is communicating this errata as widely as possible. The electronic version of GA-216-2016 will reflect this change and hardcopies of Application and Finishing of Gypsum Panel Products are now issued with the clarification noted as an errata inserted on a separate sheet. Download a PDF copy of this errata for your records. Working with code bodies and standards setting organizations, the Gypsum Association upholds the very highest product standards and promotes a deep understanding of fire and building code requirements across the design and construction community. We are committed to enhancing public safety and advancing consumer satisfaction with member firms’ products.